Looking for places to visit in Andorra and things to do? The Principality of Andorra is a great little country located in the heart of the Pyrenees and it’s most famously known for its outdoor opportunities and tax-free shops. Andorra is the smallest nation in Europe and also one of my top ten vacation spots in Europe this year. Andorra is certainly a popular destination for a skiing vacation in winter but skiing isn’t the only thing to do in Andorra. For instance, in the autumn you can visit museums and art galleries, while in summer and spring you can enjoy Andorra’s beautiful outdoors hiking the slopes and getting close to nature. 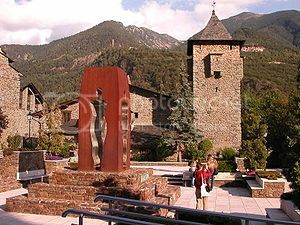 Andorra la Vella is the capital city of Andorra and a popular place to visit in Andorra because of the cultural attractions. Andorra la Vella is roughly the halfway point between the major cities of Toulouse France and Barcelona Spain. Andorra la Vella is the highest capital city in Europe and also one of the oldest cities. One of the popular things to do in Andorra la Vella is enjoying a sightseeing tour of the city's quarters such as Andorra la Vella’s old town which boasts beautiful old cobblestone streets, old churches and old stone houses. The Andorra la Vella’s main square is also a popular place to enjoy some sighseeing because of the beautifully decorated building facades. Cool Attractions that you can visit in the city include: Casa de la Vall (pictured), which is the only courtroom in Andorra and it’s a popular thing to do in Andorra la Vella, as it’s open for free to everyone. If you’re into art, the Government Exhibition Hall has interesting and changing art exhibitions showcasing local artists. Another sightseeing opportunity it’s Caldea health spa which is a complex made out of glass and it’s visually a stunning building to look at. If you’re visiting Andorra during the summer or spring months, Sordeny Nature Park is one of the most popular places to visit in Andorra during the warm months because of its excellent hiking opportunities. Sordeny Nature Park is also a nature preserve so if you enjoy wildlife spotting, you’ll enjoy scanning the area for the famed chamois, which is a goat-antelope species. Sordeny Nature Park is located near the town of Ordino and it is an excellent day trip opportunity from the capital as it is only 15 minutes drive north of Andorra la Vella. La Cortinada village is another of my favorite places to visit in Andorra for a quiet and rustic vacation and enjoying the true Andorran way of life. La Cortinada is another great day trip opportunity from Andorra la Vella, being just 20 minutes drive from the capital. If you’re spending a few nights at La Cortinada village, you definitely want to check out the main attraction at the village – San Marti Church – which boasts beautiful frescoes. Soldeu is a busy and family-oriented skiing town during the winter months (Dec-April) and one of the most popular places to visit in Andorra for a cheap skiing vacation. During the warm months, the steep hills surrounding Soldeu make it an ideal place to enjoy some serious hiking and biking up and down the slopes. Encamp and Pas de la Casa is one of the most popular destinations for winter sports in Andorra and the Pyrenees, hands down! Pas de la Casa is part of Encamp, though it’s actually located 40 minutes drive east of Encamp’s town center. Pas de la Casa ski resort is one of the most popular ski areas in Andorra, mainly because of its easy accessibility, but also because of the vibrant and lively nightlife that draws many young snowboarders and skiers alike. Encamp is also popular because of its duty free shops so it’s one of the most popular places to visit in Andorra to enjoy a bit of tax-free shopping. If you’re a car enthusiast or interested in vintage cars, don’t miss visiting the National Automobile Museum in Encamp.